Front photo: A very spring training photo. Ties to my personal collections: I super collect him. 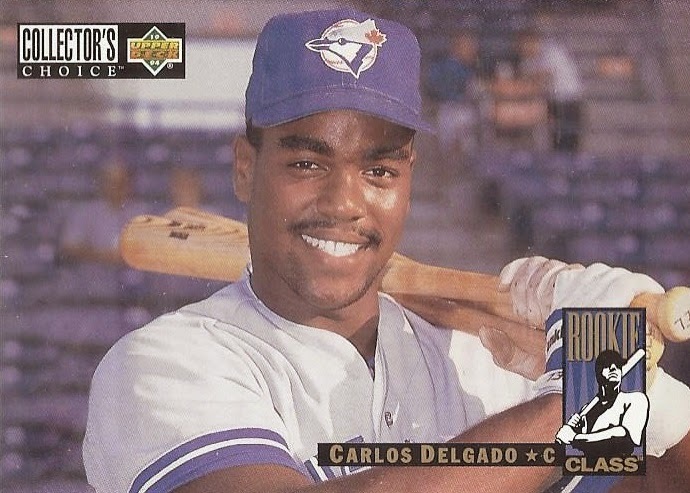 Collect his Jays cards for my Delgado PC and my Jays collection. Collect his Mets cards for my Delgado PC and my Mets collection. 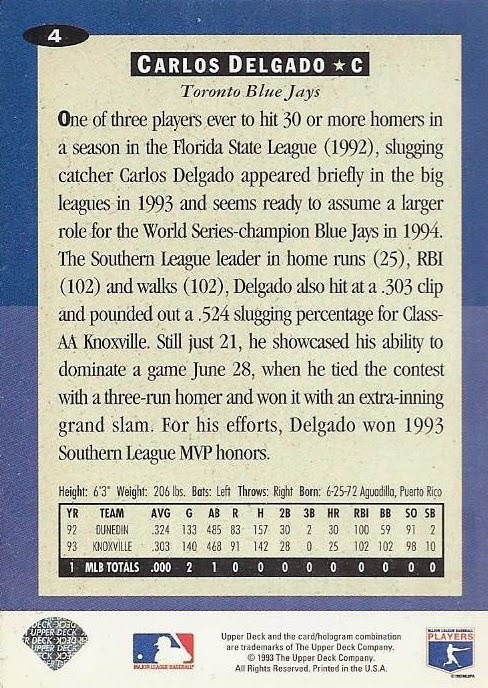 Collect his Marlins cards for my Delgado PC. Paragraphs in wikipedia entry: 28. The first player so far to have a Table of Contents in his entry. Wiki-facts: Won the Roberto Clemente Award in 2006, as a Met. The 10th member of the Toronto Blue Jays Level of Excellence. Only had 1 AB in 1993, but still got a World Series ring. How was his strike-shortened 1994? : Batted .215 with a 9 home runs. Started with the team and started hot powerwise, but was soon returned to the minors. Birthday boy: Born June 25, 1972. He's also the first player so far to have his birthdate appear in the June 25 portion of wikipedia. Also born on that date, Saif al-Islam Gaddafi, one of the sons of late Libyan leader Muammar Gaddafi. Carlos is the only person on baseball, football, basketball and hockey reference with a 6-25-1972 birthdate. Next up: #5 Steve Dreyer.